I'm with Delacourt. As I read the Wilson-Raybould interview I realized that she was using her solicitor-client relationship to avoid the tough questions. All she had to do was deny that JT had twisted her arm to take SNC-Lav off the hook. Denying that would not have breached her professional duty of confidence. It was because she wouldn't deny these allegations that I had to conclude they were probably true. As for this prime minister, those who take him at his word at this point should know better.Remind me how many of those well-placed tax wizards at KPMG ever saw the inside of a cell over the Isle of Man tax scam. By my recollection that would be none. Then there was the "cash for access" in the first year of the Trudeau government. I'd also like someone to explain why Morneau gave Kinder Morgan and its execs such a sweetheart deal on Trans Mountain at the very moment Kinder Morgan was ready to throw in the towel. As I look on Justin I can't help but draw on PET as a yardstick. Here the apple fell far from the tree and kept rolling downhill. You look at all the tough issues the father unhesitatingly tackled - the status of women, homosexuality, abortion, patriating the Constitution and then that lasting gift, the Charter of Rights and Freedoms. It wasn't an unbroken chain of successes but it was impressive and, perhaps, unique to its time, the pre-neoliberal era. I'm a real fan of PET. I have eight (I think nine) books on the man and his government, three of which are critical. I greatly admired his intellect and enjoyed watching him at work during Question Period. It was an exercise in "reason over passion" that drove the opposition to despair. There's none of that in JT. He's quite boring on his feet. Do I believe his fanciful account of the SNL-Lavalin controversy? I can't see any reason why I should. As you know, Mound, I voted for Justin and had high hopes at the outset that politics would be different under his tenure. It didn't take me long to grow disillusioned. Clearly, he is his father's son in name only. Simon will think of some excuse for Trudeau's behaviour, bank on it. No doubt he's beavering away as we speak, desperate to keep Justin's noble head above troubled waters. Fancying someone from afar, as the Brits like to call it, will lead you down the garden path to ridiculousness if you let it, and he has. I'll repeat what I said in the days after the Lib win in 2015, and several times thereafter. About Oct 14 when it was becoming clear JT would win, out of nowhere came Paul Martin to whisper in Justin's ear at a rally. It was on video. The latter looked surprised upon hearing the words. I saw the old guard revivified at that moment, their troubles over, and their new man was co-opted on the spot by more or less threat. You wonder who runs this country? The billionaires, and Martin is one, while portraying himself as a lovable doofus who likes gardening. Then there was Morneau's Economic Council of Jan 2016, where more than a dozen people of high industry and academe, chaired by an accountant from one of the bigwig firms, pledged to offer economic advice for a $1 a year each as Canadian patriots. As if they were actually altruistic. It was neoliberal input writ large, and Morneau's subsequent behaviour shows it. Now we are taking part in regime change in Venezuela, while any mention of the years of US sanctions which brought that country to its knees is expunged from the record, never once mentioned, and we are told we're high-minded saviours of the common folk from a mad dictator. Bullsh*t! From beginning to end, on every file, Trudeau stinks. Someone tries to do a good job, and boom - demoted. The most fantastically nonsensical reason I heard was that Wilson-Raybold was shifted to Veterans because Brison resigned. What possible connection is there? None. Lies, DISHONOURABLE PEOPLE, that's the Liberals for you. The whole thing stank back in late 2015, and I was roundly criticized by some old blogger called Scotian on iPolitics when it was half-decent, who thought I should give Trudeau a chance when I could see the back-pedalling coming apace. Others piled on - Justin was the fair-haired boy. I was being mean. I saw through the scam before the end of November 2015 - call it a feeling if you must. Poor end-of-life legislation far from what people expected, proportional representation thrown out to the distress of the Liberal head of the Commons Committee studying it, and so on. 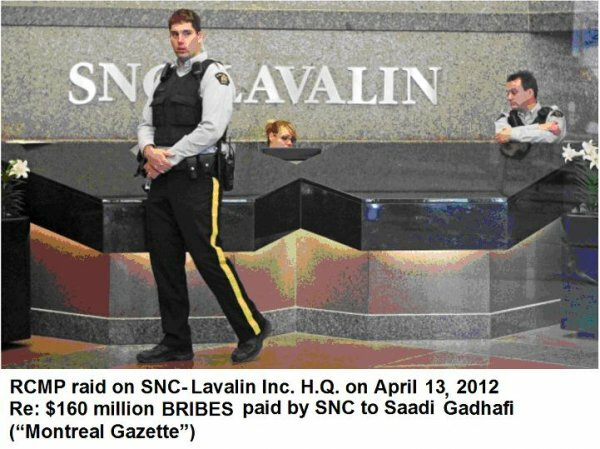 That carryover Bill C51 from harper was supposed to have public input and revised, according to Goodale - may we ask when? Nothing has happened. And any Canadian driving can now be pulled over FOR NO REASON WHATSOEVER and subjected to a breath or drug test. Freedom? Good government? Not subject to unreasonable search and seizure? Don't make me laugh. Then there's the matter of the 392 unfilled promises of the 394 Trudeau promised during the election campaign, listed so lovingly on his website at the time. What do we actually get? Same old, same old. Grubbies out to fill their pockets and lord it over the rest of us, or trying to avoid prosecution. The Conservatives, as Douglas Fraud shows in Ontario are similarly rapacious. And who can forget harper, now willing to sell out the country for consultancy fees. A damn traitor! Screw the whole damn lot of pocket-picking political skunks from the two main parties! Jagmeet Singh is only interested in the status of being leader of a major party. He expects to be feted for that alone. Work? Policy? What's that? Aren't there minions to carry out the daily slog? Why be a leader if you can't swan around doing bugger all seems to be Singh's idea of his responsibilities. He cannot answer questions properly, uninformed as he is, and will go down in flames one way or another. I'm with Mound, vote Green. The only minor hope. The neoliberal pattern, as you point out, has been clear for some time, BM. I think we do no one any favours if we try to ignore, justify or sugarcoat Trudeau's myriad and manifest failures. I did read The Mound's post about voting Green in the next election, and I am giving it very, very serious consideration. While at one time the NDP might have been an option, Singh has put to bed any such notion. His ineptitude is indeed breathtaking. Great post BM. "Progressives" who refuse to criticize Trudeau frustrates me to no end. The cheerleader you spoke of has lost all credability. I had high hopes. I'm deeply disappointed. But what other options have we got? It is a question bedeviling many, I am sure, Owen. As I mentioned in my above comment to BM, I am giving serious consideration to the Mound's suggestion about voting Green. But ... but ... but ... Benghazi! Nothing to see here folks. Just another shiny thing to distract from the non-existent Conservative platform. I wonder what the Globe or N Post will come up with next week? I bet it ... Look, Squirrel! Believe me, UU, I am not in any way fooled by the faux outrage being expressed by the Conservatives. Nonetheless, the allegation of political interference is a serious one, and merits serious investigation. If Jody W-R was so principled that she would not do what the PM supposedly was pressuring her to do then she would have left cabinet and not accepted a “demotion”. The only FACT we have is that she was moved to a different portfolio in a cabinet shuffle. We don’t know anything else about the “why” of the move. Do you know what "fancying someone from afar" you failed English teacher? SUMMARY: I fancy you means I like you in a romantic/sexual way. So once again you are allowing some old homophobe to slander me without consequence. At least this one isn't threatening my life...yet.